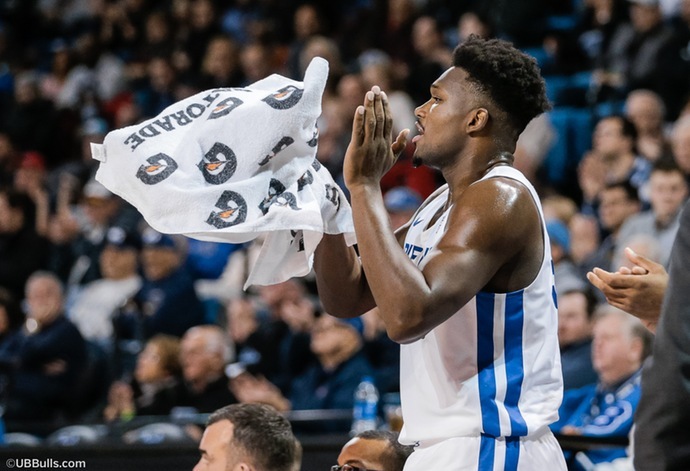 • For the second straight year, UB will play regular season games outside of the United States as they play two games at the Belfast Hall of Fame Classic. Last season, UB played three games in the Cayman Islands, but these will be the first regular season games in Europe for Buffalo. • Buffalo is looking to start the season 6-0 for just the second time in school history and the first time since the 1930-31 season, when UB went 15-0, their only undefeated season in school history. • The Bulls are ranked 21st in the latest AP Poll as they become just the third MAC program to be nationally ranked by the Associated Press since 2000 joining Kent State in 2008 and Ball State in December of 2001 where they peaked at 15th in the nation. UB bumped up five spots in the latest USA Today coaches poll, the first MAC program since Akron in 2012-13 when they were ranked #25. • Sophomore Jayvon Graves tied his career high in scoring in each of UB's two games this past week as he had 16 points in the wins over Dartmouth and Marist. Through just five games this year, Graves already has a third of point total from last season. He is also currently second on the team with seven blocked shots and tied for second in steals. • Buffalo currently leads the Mid-American Conference in scoring margin, defeating opponents by an average of 19.0 points per game. • Milwaukee is 2-4 on the season, but has won two straight games after dropping their first four contests of the year. The Panthers are coming off a 79-70 win over Albany on Friday. Prior to that, Milwaukee defeated LIU-Brooklyn in overtime, 92-87. • Milwaukee has two players averaging in double figures in points, led by Darius Roy, who is averaging 18.2 points per game and he also leads the Panthers with 29 assists. Carson Warren-Newsome is second on the team in scoring at 11.5 points per contest and he has 20 assists on the year. DeAndre Abram leads Milwaukee in rebounding as he pulls down 9.2 rebounds per contest, while also adding 9.5 points per game. • Milwaukee was picked to finish in eighth place in the 10-member Horizon League, receiving one first place vote. Wright State was picked to win the league followed by Northern Kentucky. • Pat Baldwin was named head coach of the Milwaukee men's basketball team on June 20, 2017. In his first season on the bench, he led the Panthers to 16 victories, an improvement of five wins over the prior season while also finishing four spots higher in the final Horizon League regular season standings. Baldwin joined Milwaukee from Northwestern University where he spent four seasons as an assistant coach at North-western, helping rebuild his alma mater into a force in the Big Ten. Baldwin, a 1994 graduate of Northwestern, was one of the top players in school history. He still stands among the top 20 scorers, was a three-time team captain, graduated as the school's all-time leader in steals and assists, and was the Big Ten Defensive Player of the Year as a senior. A native of Leavenworth, Kansas, Baldwin got his coaching start during the 2001-02 season at Lincoln University in Jefferson City, Missouri. Having moved up in the national rankings yet again, the #22/#21 Buffalo Bulls will begin their two games in Belfast, Northern Ireland on Friday morning against Milwaukee. This is the second straight season that UB will play games outside of the United States, having played last year in the Cayman Islands, but it will be their first ever regular season games in Europe. After playing Milwaukee on Friday, the Bulls will face Either Stephen F. Austin or San Francisco on Saturday. Like Buffalo, San Francisco enters the tournament undefeated on the season. While this will be the sixth meeting all time between the Bulls and Panthers, UB has never face Stephen F. Austin or San Francisco. Senior CJ Massinburg had a career night in the win at nationally-ranked West Virgina as he scored 43 points and 14 rebounds. His 43 points are the fifth highest total by a player in the nation this year. The career performance helps move him even closer to becoming UB's all-time leading scorer. Massinburg currently has 1,436 career points, which is sixth all-time in school history as he passed Turner Battle (2001-05) in the game at Southern Illinois. Next up on the list is Yassin Idbihi (2003-2007) who is in fifth place with 1,514 points. With a strong senior season, Massinburg could surpass the 2,000-point mark and become Buffalo's all-time leading scorer. With his 22 points last week in wins over Dartmouth and Marist, senior Nick Perkins is now 12th on UB's all-time scoring list with 1,300 points, just 14 points shy of Calvin Cage (2002-06) for 11th place. Perkins was named first-team All-MAC last season and he was named the MAC's Sixth Man of the Year for the second straight season. Perkins scored in double figures in 25 straight games last year after returning to the bench. Over the previous two years, Perkins has scored 20 points or more nine times as a reserve, the sixth highest totally nationally. Graves is averaging 12.6 points per game through the first five contests, which is second on the team. He scored 14 points in the win over West Virginia, including a few monster dunks right over the Big 12 caliber foes while tying his career high against Dartmouth with 16 points, making his first appearance on Sportscenter's Top plays this season. He added 16 more points in the win over Marist, tying his career high with four three pointers.